An important aspect of the ESIP community is recognizing the outstanding accomplishments, achievements and service of our community members and individual participants. At the 2019 ESIP Winter Meeting, we recognized the phenomenal efforts of the following individuals, groups, and member organizations. 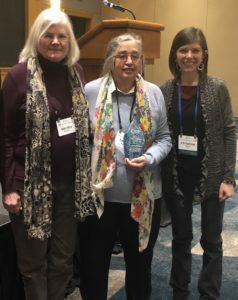 Lesley Wyborn (center) with the Award's namesake Martha Maiden (left), and 2018 ESIP President, Christine White (right). The Catalyst Award honors those who have brought about positive change in ESIP and inspired others to take action in the past year. “This year’s award goes not to one person but to three women who have served, not only ESIP, but the Earth science community. They are true leaders on the front lines, affecting positive change and advancing science, but in ways that are less glory and more guts. This year, the Catalyst Award goes to Margaret Mooney, LuAnn Dahlman, and Shelley Olds, for their long-running service in the ESIP Education Committee. These leaders do not only plan the Summer Meeting Teacher workshop, the Out2Lunch seminars, and advocate for getting science and informatics – and coding – resources into the classroom. They are also mentors and role models to many of us in ESIP – sometimes in their words, but always in their actions. The Committee would like to give note to the hard work of the whole committee – Becky Reid, Bob Downs, Patty Reif, Carla McAuliffe and many others. Check out this Tweet about the Awardees. 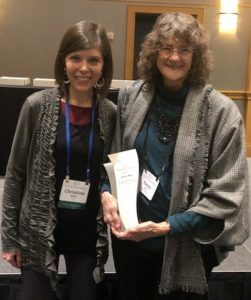 President's Award recipient, Karen Moe (right), with 2018 ESIP President Christine White (left). “Most significant is a difficult bar. We cannot know all the contributions you all make. But this year’s award goes to someone who has served ESIP well in the past but also continues to serve, provide thoughtful counsel, valuable perspective, and also appropriately fiery energy for making data a first class citizen in a world where that is not always the case. Also – this person is so humble, they are listening to all this and would never guess this award is going to them. This year’s President’s Award goes to Karen Moe. Karen spent the last 40 Years at NASA, and the last 20 or so were with NASA’s Earth Science Technology Office (ESTO) – which is also celebrated its 20th anniversary last year. Karen has been NASA Emeritus for the last 3 years, volunteering her time at ESTO. Her focus at ESIP has been in the area of disasters and opps to apply Earth Observation data and technology for social benefit. The Disaster Cluster fits in that very well, and as the cluster expands into health and human services, Karen see opportunities to bring science data to that environment. But also – Karen has served on ESIP’s Board for the past two years, digging in to help with ESIP’s AGU strategy. The Partner of the Year Award honors an ESIP member organization that best exemplifies the spirit of ESIP in one or more areas. For the 2019 award, we were particularly looking for member organizations that have supported ESIP's 2015 – 2020 Strategic Goal #3 (Promote techniques to articulate and measure the socioeconomic value and benefit of Earth science data, information and applications). 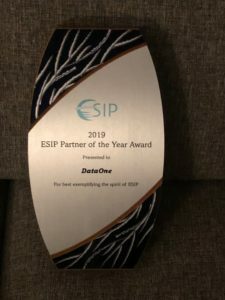 The award was presented to DataONE by ESIP Partnership Committee Chair, Nancy Hoebelheinrich. Rebecca Koskela accepted the award on behalf of DataONE. Nancy noted that DataONE has been a long time collaborator with ESIP and has been a very important contributor to building networks of collaborators within the Earth science data community. DataONE has contributed tremendously to raising the awareness and understanding of the socioeconomic value of data by contributing to education on research and data lifecycles, and developing best practices and de facto standards for creating, sharing and managing Earth science data, especially environmental data.